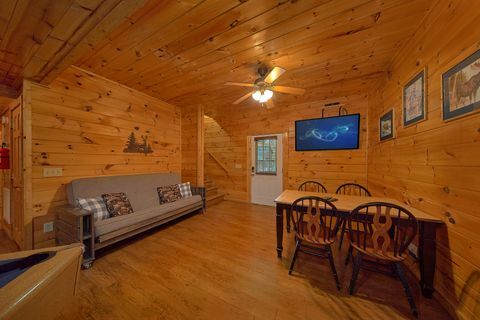 "Paws A While," a Pigeon Forge 4 bedroom cabin, keeps guests close to all the action with its location just a mile off the Pigeon Forge Parkway. 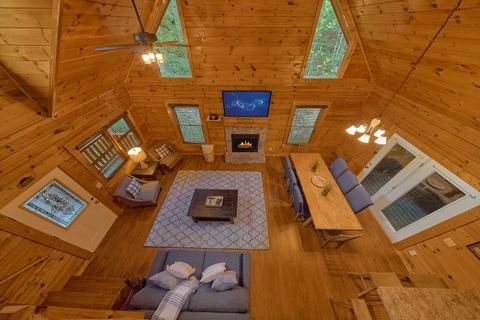 This group cabin in Pigeon Forge sleeps up to 12 guests, making it perfect for groups or family reunions. 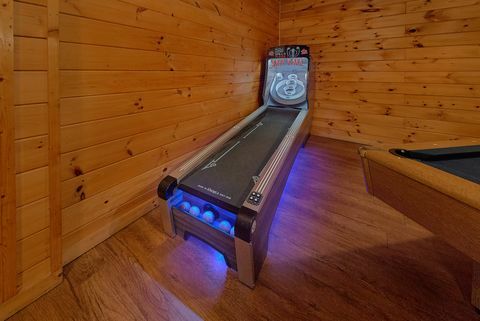 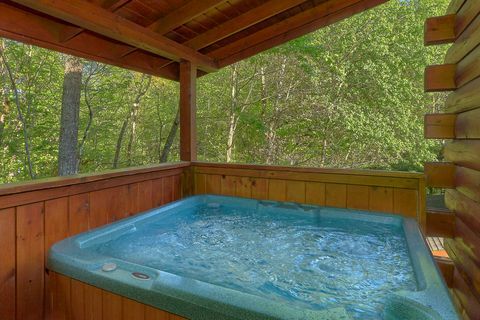 This cabin comes with plenty of fun features for families, including swimming pool access, year-round hot tub, game room with a full-size pool table, and more. 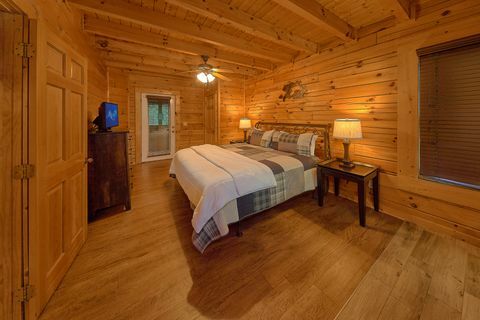 This cabin also offers a chance to enjoy a Smoky Mountain vacation in a lodging that's just as comfortable as home. 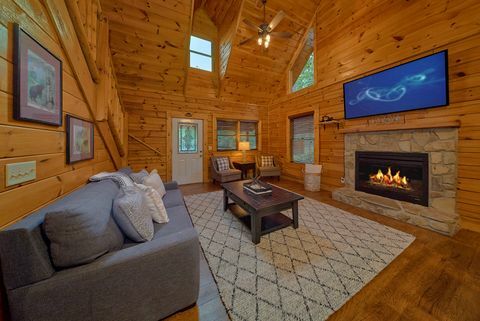 The main level of your Pigeon Forge group cabin offers a welcoming living room with gas log fireplace with a handsome stone mantle. 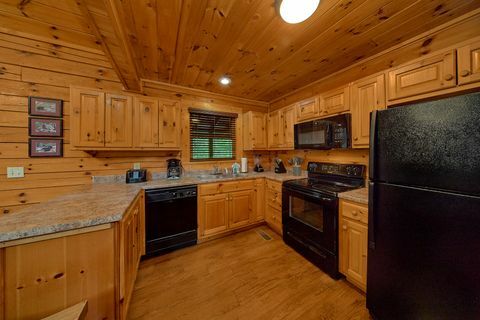 Enjoy cooking family meals in the kitchen with plenty of counter space and a dishwasher for easy cleanup. 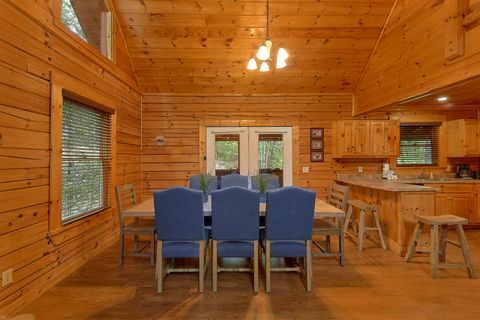 The whole family can enjoy a meal at the dining table together. 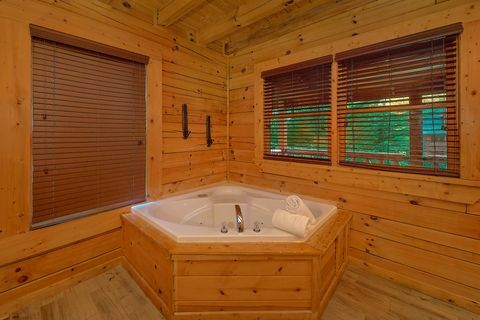 One of two master suites rests on this level and offers a king size bed, in-room jacuzzi tub, television, full bath, and private doorway to the cabin’s hot tub. 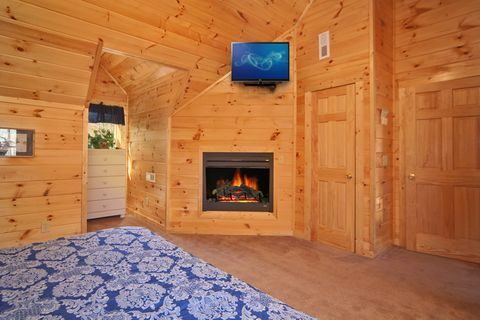 Upstairs, the second master suite offers a king size bed, in-room jacuzzi tub for two, a romantic corner fireplace, full private bath, and television, creating a private oasis for relaxation. 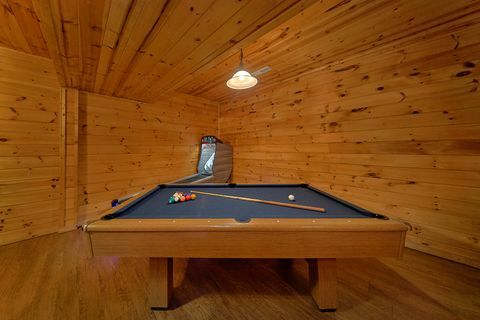 On the bottom level, guests can enjoy fun and entertainment in the game room with full-size pool table and additional sitting area for watching the big game. 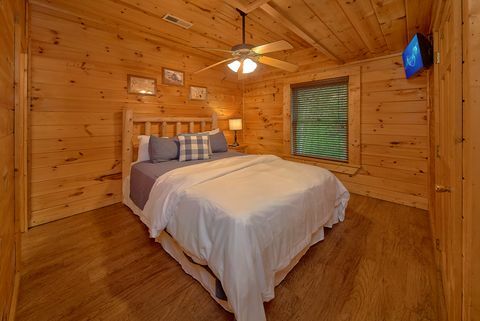 You'll also find the other 2 bedrooms, which each feature a queen-size bed, television, and private full bath, on this level as well. 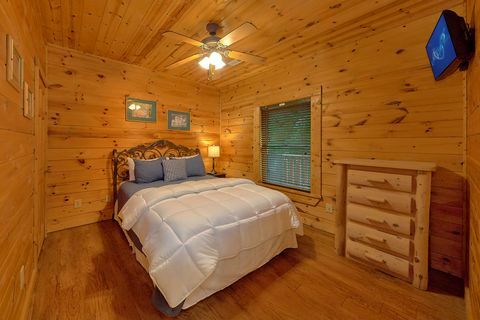 Come stay in "Paws A While," your group cabin in Pigeon Forge! 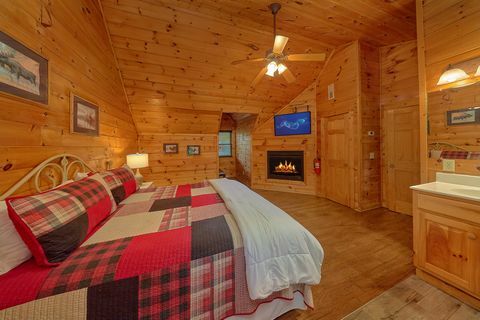 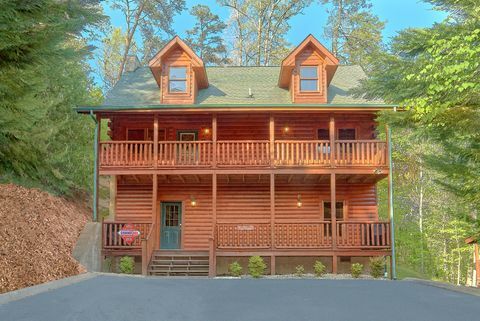 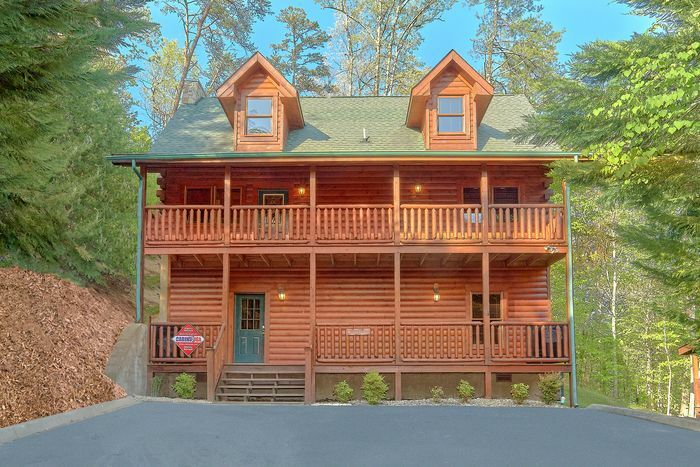 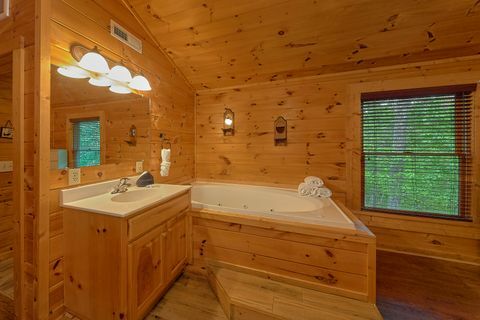 Book this Pigeon Forge 4 bedroom cabin online today for an immediate Online Cabin Discount!